As an executive, you’re responsible for making decisions that lead the company into a sustainable, scalable, profitable, and ultimately, salable future. Consistent decision-making proficiency is one of the seven Executive Strategy Skills™ critical to business leadership. Often, you’ve got to make decisions without complete data, and sometimes this causes analysis paralysis. Delaying a decision can mean that you miss out on exploiting an opportunity or substantially increase the cost of action. When uncertain what to do, review your vision, mission, and culture statements. These guidelines define the constitution of your company. All decisions must support this, or it’s time to rewrite your founding documents. What the heck is OODA? The OODA loop is the decision cycle of Observe, Orient, Decide, and Act, developed by military strategist, US Air Force Colonel John Boyd. He applied the concept to combat operations when the right decisions determine the difference between living and dying. When you don’t know how to decide, start with what you know. Observe: What’s going on? Circumstances? Intelligence? Command and Control state? What do you know? Orient: With respect to experience, culture, resources. What’s your context? Decide: With certainty or make a hypothesis and formulate a test strategy. What’s the most resourceful option given the mission? Act: Take action or test the hypothesis. Do it because you can decide again with more data. Restart with Observe using your new insights. The OODA loop clarifies your situation, tools available, decision making ideas, and feedback to deliver a decision strategy that stands the test of time. Understand the impact of this decision to determine the level of analysis required. Few decisions are permanent or fatal. What is the likelihood that I know 80 percent of what I need to know and that’s sufficient? What do I need to know that I don’t yet know? You might be surprised at the answer that comes to mind. What would it cost if I made the wrong decision.? 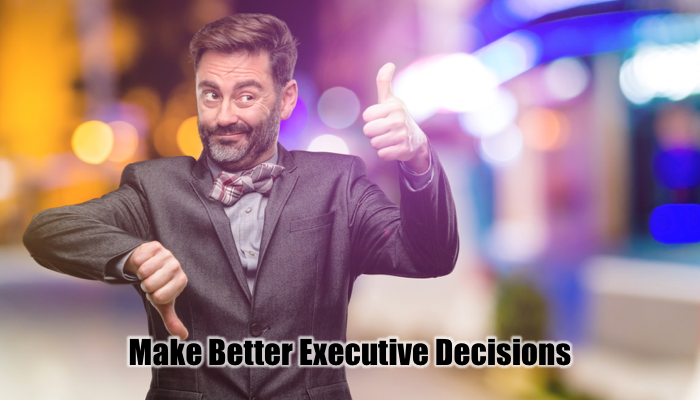 If it costs less to fix than your executive hourly value, make the decision right now. Calculate your executive hourly value by dividing the revenue that you’re responsible for by 2080. It’s $480/hour/$million. If the decision has high impact or could be expensive if it’s the wrong decision, ask yourself these questions. Do I have clarity on my criteria? Criteria is how you’ll decide. Make a written list of the key items that you’ll need to know and their critical thresholds for your go-no-go decision. If you’re not sure about the criteria, go ask your expert in that area. The only advice that matters comes from people whose history is your future. Only get advice from people who understand the impact of your specific criteria. They understand the importance of getting the criteria right because they understand the impact of the criteria on the decision. Frequently, decisions get made based on personal preference that has no bearing on the criteria. For example, many good marketing plans get killed when an executive’s spouse doesn’t like the colors or design of the marketing collateral. I recently observed a game in which a person listened to two other people simultaneously tell different stories. They observer then told each of the stories that they heard. The shocking realization was that everyone who played the game got details of the stories mixed up. They were certain that they had the stories right, but didn’t. I observed false memories being created on the spot. What I learned is that I must be fully present when I gather information, with no multitasking or distractions. If one data point is suspect, it’s all suspect. Until it’s not. If the data seems wrong, get clarification. In this case, trust your gut instinct.